The laser emits a very specific light beam that is absorbed by the pigment located in the hair follicle. The laser is pulsed for a fraction of a second. 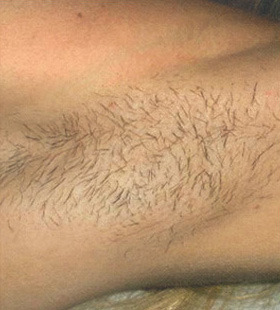 The duration of the pulsed have been carefully determined so that enough energy is absorbed by the hair follicle to disable it but not so much that excess heat is transferred to the surrounding skin, resulting in safe and effective hair removal. Lasers are precise instruments that can be adjusted to the exact parameters that will specifically disable the hair follicle. The laser uses a wide beam that treats hundred of hair follicles a once instead of treating hair by hair like electrolysis. Because of this, large areas such as legs, arm, or a back can be treated in a short amount of time. You will see results that last far longer than tweezing, waxing, shaving, chemical depilation, or other temporary treatments.